Trump spokeswoman Sarah Huckabee Sanders said Wednesday that the White House is reviewing Pruitt’s conduct and declined to confirm reports by The Associated Press and others that the president called Pruitt in recent days to offer support. On Tuesday, the administration had put out word that the president had Pruitt’s back. By Wednesday, White House officials were describing his situation as unsustainable. Speaking on the condition of anonymity to discuss internal deliberations, they said the EPA administrator was given a green light to sit down for the Fox interview, adding that if he failed to clear the ethical cloud his job would be in serious doubt. More than two dozen members of Congress, including two Republicans, called this week for Pruitt to resign or for Trump to fire him. For his part, Pruitt denied that his job was in any danger, saying his enemies will “resort to anything” to stop his and Trump’s regulatory rollbacks. In an interview with Fox News on Wednesday, Pruitt rebuffed media reports that he bypassed the White House to grant huge pay raises to two young aides he brought with him from Oklahoma, where he previously served as state attorney general. 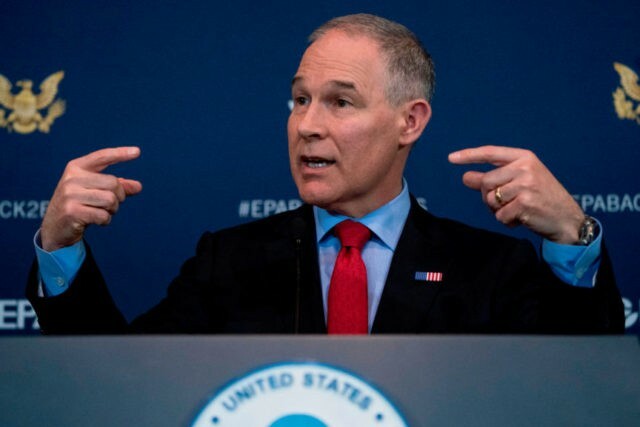 The Atlantic reported Tuesday that White House officials denied permission to grant the raises to the political appointees, by that Pruitt used a little-known legal maneuver to push them through anyway. A 30-year-old lawyer serving as Pruitt’s senior legal counsel got a 53 percent raise, boosting her salary to more than $164,000. Pruitt’s 26-year-old scheduling director got a 33 percent raise, increasing her salary to nearly $115,000. Asked about the issue by Fox correspondent Ed Henry, Pruitt denied approving the pay hikes. “I did not. My staff did and I found out about (it) yesterday and I changed it,” Pruitt said, adding that the agency was now “walking back” the raises. Pressed on who approved the spending, if not him, Pruitt claimed he didn’t know. Pruitt is reported to have approved the raises under a provision to the Safe Drinking Water Act of 1977 that specifically authorizes the EPA administrator to hire a limited number of employees without approval from the Senate or the White House. Pruitt spokesman Jahan Wilcox did not respond to questions Wednesday about who at EPA granted the raises, or if Pruitt had delegated his hiring authority under the act to someone else. The questions surrounding the raises are the latest ethical issues dogging Pruitt, who has been under increasing scrutiny for outsized spending that includes overseas trips, his use of first-class air travel and unusual security precautions. Pruitt is also pushing back against criticism of his decision last year to lease a Capitol Hill condominium co-owned by the wife of prominent Washington lobbyist Steven Hart, whose firm represents fossil fuel companies. Pruitt paid $50 a night for the unit — totaling $6,100 in payments over the six-month period he leased the condo, an average of about $1,000 a month. Current rental listings for two-bedroom apartments in the neighborhood show even the more modestly priced units typically go for more than twice what Pruitt paid. “I’m dumbfounded that that’s controversial,” Pruitt told The Washington Examiner on Tuesday, insisting that he paid a market rate. Pruitt also described Hart, the registered lobbyist, as a personal friend from Oklahoma who didn’t have business before EPA. Hart is chairman and CEO of the powerhouse Washington firm Williams & Jensen, which required federal disclosure reports show lobbied EPA extensively in the last year — including Pruitt himself. The Associated Press reported last week that while living in the Harts’ condo he met in his EPA office with a lobbyist from Hart’s firm and two executives from an energy company seeking to scuttle tighter pollution standards for coal-fired power plants. EPA also granted a favorable ruling to a pipeline company represented by Hart’s firm. Wilcox, Pruitt’s spokesman, did not respond to questions Wednesday about whether Pruitt’s schedule or the disclosure reports were in error. Pruitt also appeared to dispute media reports that his college-aged daughter stayed in a second bedroom at the condo last summer while she was an intern at the White House. Pruitt also told the The Daily Signal, an online publication of the conservative The Heritage Foundation, that he lived alone in the condo while his family remained in Oklahoma. Those statements appeared to contradict a memo released by EPA over the weekend drafted by an agency ethics lawyer that reviewed Pruitt’s lease. “The lease authorized use by the Administrator and his immediate family, specifically including his spouse and children, and consistent with that provision of the lease his immediate family did stay there when they were in Washington, D.C.,” Kevin Minoli, the EPA lawyer, wrote. Wilcox did not respond to questions about whether Pruitt’s daughter stayed at the condo with him. Her LinkedIn profile says she worked at the White House from May through August.